Mezcal is distilled from the maguey plant, a form of agave Americana, native to Mexico. 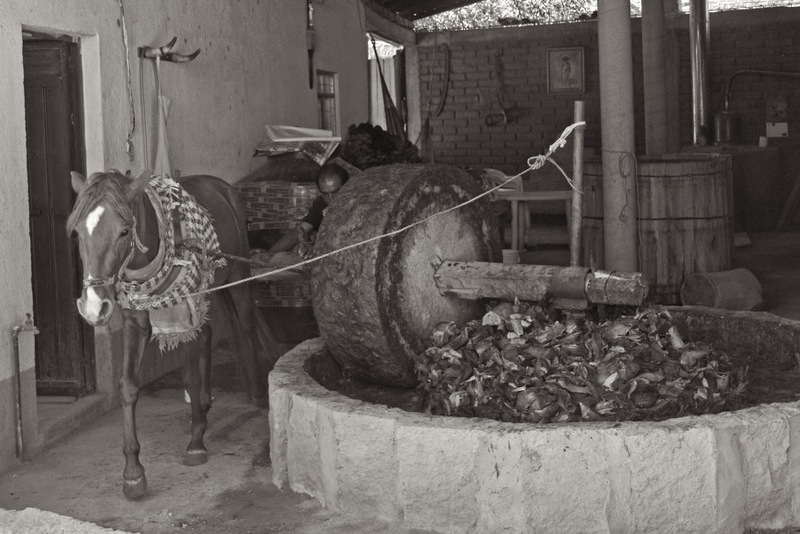 The word mezcal comes from Nahuatl metl and ixcalli which mean 'oven cooked agave.' 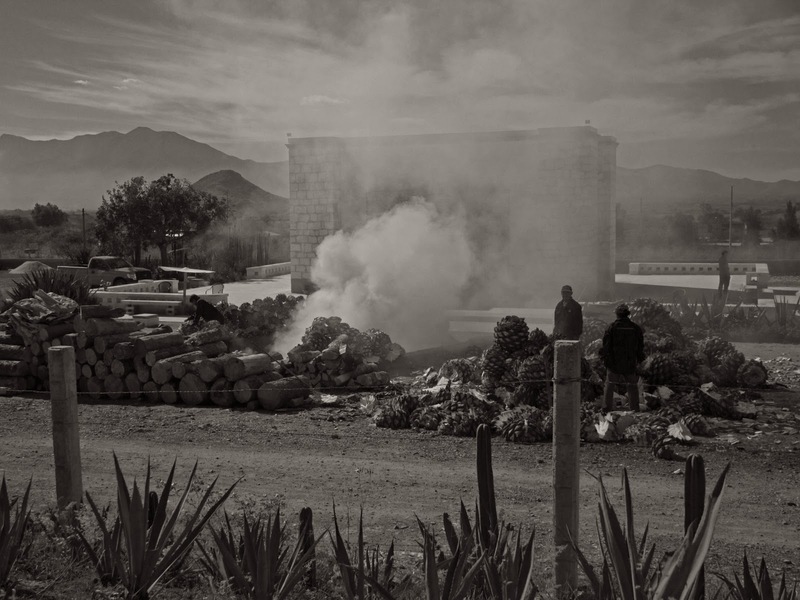 Maguey grows in many parts of Mexico, though most mezcal is made in Oaxaca. There is a saying attributed to Oaxaca regarding the drink: "para todo mal, mezcal, y para todo bien mezcal también". Maguey was one of the most sacred plants in pre-Hispanic Mexico, and had a privileged position in religious rituals, mythology and the economy. 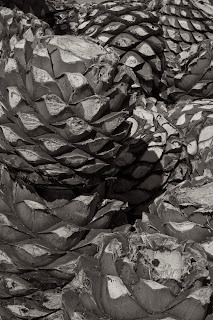 Cooking of the “piña” or heart of the maguey and fermenting its juice was known prior to the Spanish conquest. The origin of this drink has a myth. It is said that a lightning bolt struck an agave plant, cooking and opening it, releasing its juice. For this reason, the liquid is called the “elixir of the gods.” It is unclear whether distilled drinks were produced in Mexico before the Spanish Conquest. The Spaniards were introduced to native fermented drinks such as pulque, also made from the maguey plant. Soon the conquistadors began experimenting with the maguey plant to find a way to make a distillable fermented mash. The result was mezcal. The agave or maguey plant is part of the Agavaceae family, which has more than 120 subspecies. The mezcal maguey has very large, thick leaves with points at the ends. 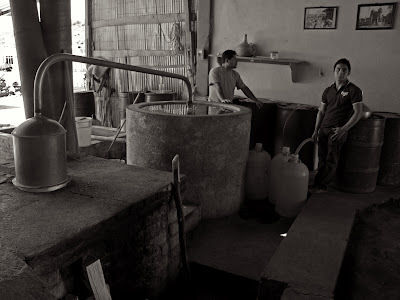 When it is mature, it forms a “piña” or heart in the center from which juice is extracted to convert into mezcal. It takes seven years for the maguey plant to mature. The maguey variety known as “manso” is considered best for the production of mezcal. Other varieties used include the “espadín,” the “arroquense” and the “tobalá.” Maguey fields are a common sight in the semi-desert areas of the state of Oaxaca. Traditionally handcrafted by small-scale producers called fábricas or palenques, using methods that have been passed down from generation to generation, the process begins by harvesting the plants and extracting the piña. 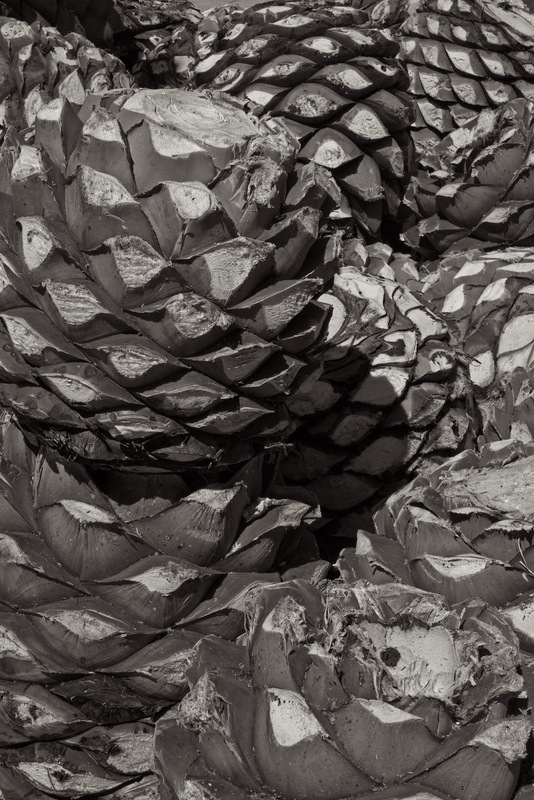 Each maguey piña can weigh forty kilograms. The piñas are cooked for about three days in pit ovens, made by mounding earth over pits of hot rocks. This underground roasting gives mezcal its distinctive smoky flavor. These piñas are then crushed and mashed, traditionally by a stone wheel turned by a horse, water is added and the mush is left to ferment in large vats or barrels. After fermenting, the resulting liquid is distilled in either clay or copper pots which will further modify the flavor of the final product. The distilled product may be left to age in barrels for between one month and four years, but occasionally can be aged for as long as twelve years. 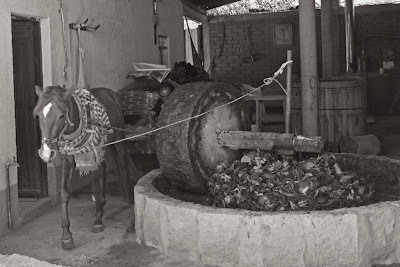 Mezcal is generally distilled only once. 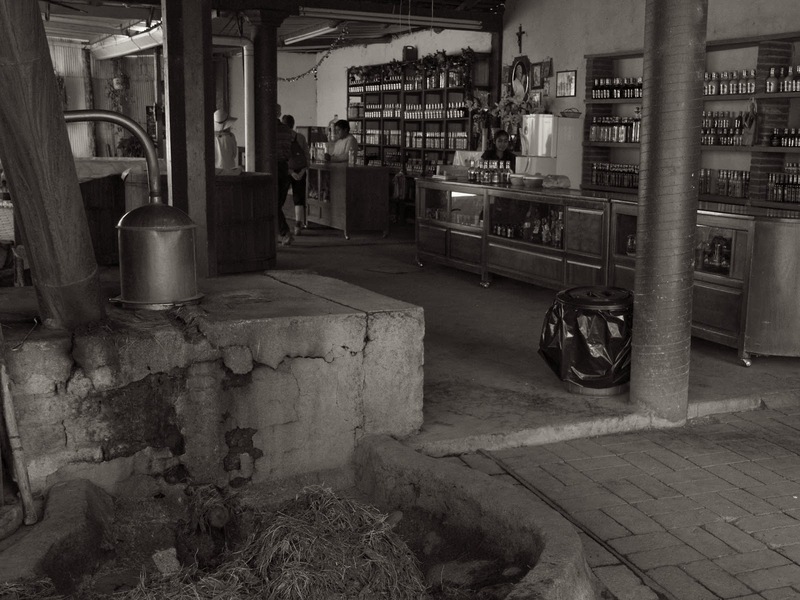 Mezcal is highly varied, depending on the species of maguey used, the fruits and herbs added during fermentation and the distillation process employed, creating sub-types with names such as de gusano, tobalá, pechuga, blanco, minero, cedrón, de alacran, creme de café and more. There are two types of mezcal, those made of 100% maguey and those mixed with other ingredients, with at least 60% maguey. In either case there are four major categories: white mezcal, clear and hardly aged; dorado, gold from a coloring agent; reposado or añejado, wood aged from two to nine months; and añejo, aged in barrels for a minimum of twelve months. If the añejo is of 100% maguey, it is usually aged for about four years. The most traditional Oaxacan way to drink mezcal is as a shot, with a side plate of fried larvae ground with chili peppers and salt and cut limes. You take a pinch of the larvae mixture and place it on the tongue, then immediately drink the shot. For more pictures check out my web album. I was so inspired by this wonderful, detailed description that I immediately brought down the bottle of Mezcal that I bought at the Etla market and had a shot (or two . . . or three).